I promised incredible Star Wars gifts for guys 10 – 12 years old and I totally deliver the very best ideas here. Honestly, I think this is the perfect age for boys and Star Wars. They are old enough to really get the inner story and understand the struggle between good and evil. They are also still at the age when they still like to play with toys and they enjoy Star Wars in a big, big way. Take a few moments to look over our guide. If you are also interested in other gift ideas for boys check our other lists too. 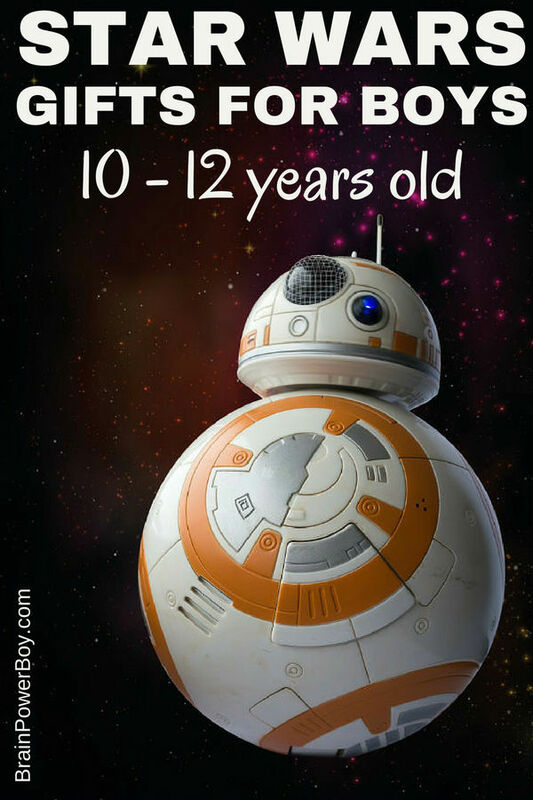 We rounded up a great selection of Star Wars gift ideas so you will know exactly the type of thing boys 10 – 12 years old will enjoy and want! The Star Wars Character Encyclopedia has been updated and expanded. It is seriously packed full of information and great images of every Star Wars character to date. I love that DK books are so visual – boys really like these. Activity book time! I wasn’t sure if I should put this under books or toys as it really is both. Either way, I can tell you that you are not going to go wrong with this Star Wars Folded Flyers idea. It is perfect for 10 – 12 year old boys because the folds are detailed and a bit too tough for some younger boys. There are 30 starfighters included and they have specialty paper so when you are done you have a very cool finished product that really flies. Here is a graphic novel that will get your boys reading through the whole series. Star Wars: Jedi Academy is set in middle school and is super funny. I know many boys who burned through these and went back and read them again, and again, and yes, again! We love mazes in our household and Perplexus has been a hit. Now hear this! There is a light up Perplexus Death Star! What an awesome idea. Oh, and it also makes sounds. This toy does require a bit of patience. You know your boy best. It is a fun challenge for the right kid. I seriously would like one of these for myself! If you want to go all out, grab this toy! BB-8 is an app enabled droid so you do need a smartphone or tablet to control it. When you get it, you and your kids are going to have a blast with this. I am simply amazed at what it can do. Click the grab this toy above link to see more and watch the video. This is the updated version with force band! Battleship + Star Wars? You bet! I think your boys will love this version of the classic Battleship game. I just found out about this highly rated game a bit ago and had to share it here. It is called X-Wing Miniatures game. This is the core set. It is a two -player game so you do need a family member or friend to play. It is a fast-paced game of tactical combat. They can play from the directions or be rather creative and add in their own ideas to this neat game. If they like light sabers, this is the gift to get. Bladebuilders is a set with interchangeable light saber parts. They can create their own light saber. It includes light and sound as well as pieces to make some very slick looking light sabers. I do love these Nanoblock sets. They can build a wide variety of Star Wars characters such as Luke and 3CPO out of Nanoblocks. If you want all the Star Wars Nanoblocks together instead of buying them individually, which is a better deal, go here. Here is something unique. The Millennium Falcon Adventure Pack is a paper crafting kit. You get all the pieces and create the Falcon starship, Chewbacca and Han Solo. If you have been around my website for any length of time, you know I have to include some LEGO sets here! At this age bumping up the number of pieces in a set makes for more enjoyment. Although if they are still playing and not only building you should make sure you pay attention to the minifigs included! Poe’s X-Wing Fighter is tops! It has a lot of great pieces and it includes 3 minifigs. It always lands in the highly rated sets. From The Force Awakens, this is a great choice. Darth Vader! These sets are a bit like Bionicle but with Star Wars characters. I highly suggest you get more than one so they can play with them or set up a scene. Go here and hover over the different figure names under “style” to see them all. If you want your boy to get up on time 😉 try these neat Star Wars Alarm clocks. They come in a variety of cartoon-like stylized characters. (BB-8 is my fav one.) They light up too! Remember the viral video of the woman and the Chewbacca mask? So funny. This mask is still a big hit and is perfect for boys. They will get a big kick out of it, I can tell you for sure. We can’t forget about the ever popular and totally collectible Pop Funko figures. Another gift idea is a Star Wars t-shirt or hoodie. You know what your boy would like better than I so click the links and look around to see what style suits him best. I hope you enjoyed this selection of Star Wars Gifts for Guys 10 – 12 years old. Be sure to check out our Star Wars gifts for boys 5 – 9 as well as there are some great ideas in there too. Ages overlap! See all the Gift Guides for Boys here.